Earthquake prediction has been considered a hopeless task by a whole generation of scientists. All the easy approaches have been tried and found to fail. But two prominent seismologists see a hint of progress in a line of research that combines precision monitoring of earthquake trends and subtle, short-lived changes in the seafloor. In a short paper in today's issue of Science, UC Santa Cruz seismologists Emily Brodsky and Thorne Lay focus on great earthquakes of magnitude 8 and 9, which are Earth's largest and most deadly seismic events. They occur beneath the ocean floor around the Pacific Rim and in other places with subduction zones, where one tectonic plate plunges beneath another. The decade since the Sumatra earthquake of December 2004, in the subduction zone west of the Indonesian island arc, has included several more events of that class. Thousands of lives could be saved if we could identify advance hints of such quakesand the science would be sweet, too. The magnitude-9 Japan earthquake of March 2011 yielded a torrent of new data about subduction quakes. For one thing, this one had foreshockssmall quakes occurring on the same stretch of fault that subsequently fails in the large mainshock. Foreshocks seem to offer promise for forecasting, but nothing about them stands out except that big quakes follow them. In themselves, they're scientifically sterile. Brodsky and Lay pointed out a hopeful thing, though: according to a 2013 paper, foreshock sequences that are relatively long appear to precede most large subduction earthquakes. Anything that makes sense of foreshocks should apply to these Big Ones. 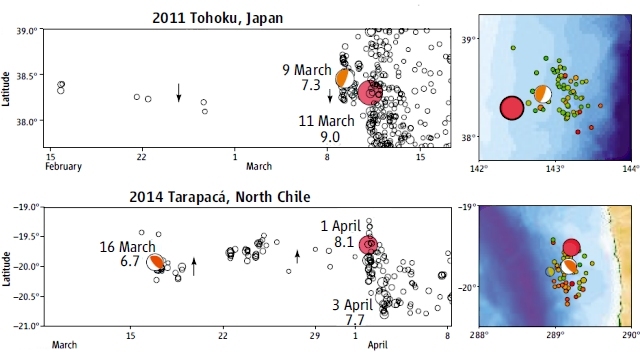 Brodsky and Lay also point to last month's magnitude-8 earthquake in northern Chile, another subduction event, which had a similar pattern of migrating foreshocks. People could feel them: "Both the local population and the scientific community reacted to the foreshock sequence with trepidation," they write, but without any seafloor data or a decent forecasting algorithm "the authorities could only communicate general concern." Citing a similar migrating earthquake sequence off central Chile in 1997 that turned out not to be foreshocks, Brodsky and Lay argue that without extra data, these sequences mean nothing actionable. We'd like to do better than that. The extra data that appeared to be meaningful for Japan came from a network of instruments (nothing more than highly sensitive pressure gauges) on the seafloor. The network is part of Japan's world-leading program in earthquake science, but the data has to be gathered by a visiting ship weeks or months later. The next frontier is to make these networks send their data in real time, making short-term forecasts at least feasible. And that's likely to be only the beginning of a long process of study by geoscientists. Brodsky and Lay conclude, "Whether earthquakes are predictable or not is still an open question, but perhaps there is now some cause for optimism." For someone like me who has watched this story for over 30 years, that's great news. Subduction-zone earthquakes threaten America from Northern California to Washington, plus Alaska, and we could use every bit of help before the next Big One. We can't see much, but we can see a little. That's the way the universe always looks before science finds a way to shed light on what once seemed hopelessly dark.